The last services on the M62, Ferrybridge was significantly hurt when the A1 through the junction was given a by-pass away from the road. A1 traffic can still access it but it's not as easy as it once was. First two hours free for all vehicles, after which cars must pay £15 and HGVs, caravans and motorhomes £29.50. HGVs can pay £31 to include a £10 food voucher. Prices are paid using PayByPhone - more details. The location code is 2437. The tall building built to house a light and airy restaurant. The services opened on 2 February 1985. Upon opening the building was described as "modern" and "tastefully furnished". It was built with a tall building which allowed a lot of light to enter, but also made it easy to hide all the utilities. It was soon noted that 1,200 people a day were passing through the doors, but most weren't spending any money. 70 jobs had been created, with a 90% female bias. In August 2000, Which? claimed that this was the worst service station in the country, highlighting the poor service in Fresh Express. 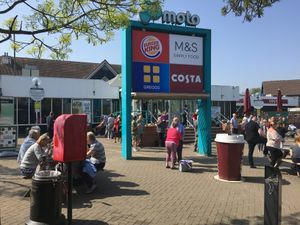 Ferrybridge had one of the last remaining Little Chefs at a motorway service area until 2008 when it was replaced by Costa. In 2013, a trial fish and chip shop in the form of Ernie's replacing EDC. During 2015 Ernie's was removed and replaced with a small Costa café, however a new EDC counter did open later next to it. A Costa drive thru and Tesla Superchargers are due to be set up here soon. As soon as you leave the roundabout to enter the services the road splits (left for cars and coaches, right for lorries), and the suddenness of this catches many people out each day. This was the first service area to be developed privately and without a nudge from the government, hence the profitable location. It was built on the site of an old warehouse which already had access from the roundabout. The owner of the land sought planning permission for a service station, and then sold the land to Granada. That new planning process was permitted as no other operators had expressed an interest in the M62, such as at Hensall. It gave way to other strategic developments by Granada such as Chieveley and Markfield. 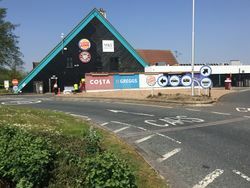 The Department for Transport said at the time they were "very concerned" about the services opening here, and were reluctant to put any signs up. The volume of traffic using the junction was reduced by the opening of the new A1(M) in 2006, creating a convoluted route for bypassed traffic wishing to use the facilities.